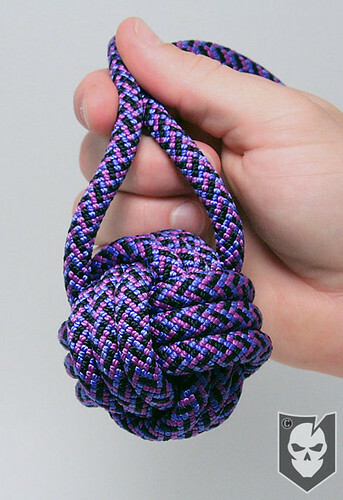 Today’s Knot of the Week is a bit of a departure from our usual knots and is more of a paracord wrapping. What we’ll be demonstrating is wrapping a small hand sanitizer bottle, often referred to as a Germ Grenade. We’re demonstrating this not to simply have a bottle of hand sanitizer at the ready, but to show the overall wrapping with a Solomon Bar and get you to see that you can realistically wrap just about any bottle or container using this method. We wrapped this Germ Grenade using a 8 ft. length of paracord for the foundation and a 9 ft. length of paracord for the working cord. Find the middle of the foundation cord (8 ft. section) and halve it. 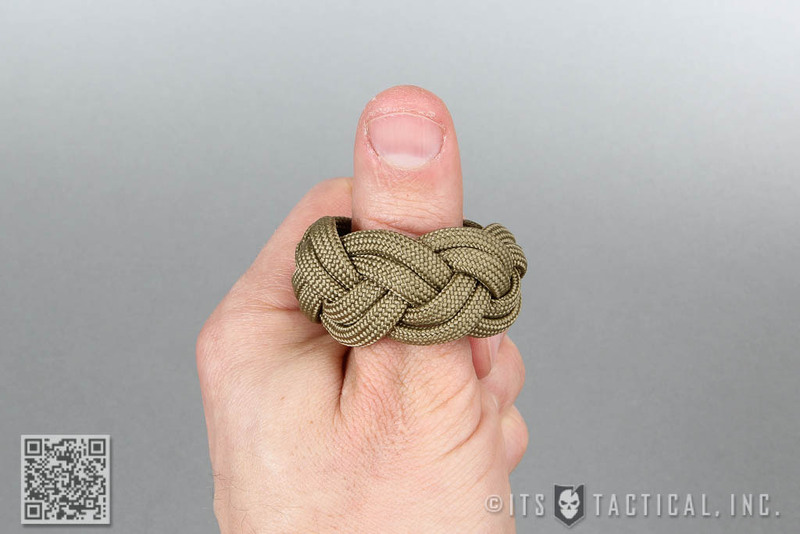 Take the bight (loop formed) and check that the size will fit over the shoulder of the object your wrapping. Find the middle of the working cord (9 ft. section) and halve it. Place the middle of the working cord across the bight in the foundation cord and tie and overhand knot. Bring the left side over the front of the foundation cord. Let the right side hang down in front of the left side. Run the right side behind the foundation cord and through the loop created. Repeat steps 8 – 10 by bringing the right side over the front now. Continue alternating between starting from the left or the right until you have the length needed to span the length of the object you’re wrapping. Take the leftover working ends of the working cord and tie and overhand knot. Attach the loop created by the foundation cord around the neck of the object. Take your foundation strands and girth hitch through the loop. Use a pen and loosen the outer wrapping of the Solomon Bar and weave the foundation cord through the respective sides (see video and photos). Don’t forget to trim and fuse the ends of the working cord (see video). Continue weaving the foundation cord on each side until reaching the desired amount of wraps on each side. 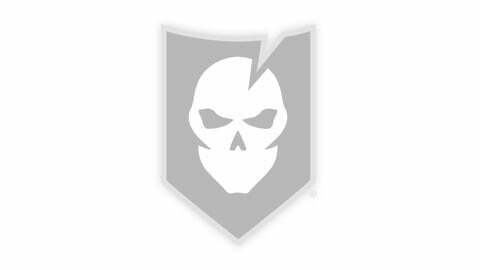 Your germ grenade is now complete with the exception of threading a keychain or any desired attachment method to the bottom of the Solomon Bar. Please refer to the instructions in our Lanyard Knot KOTW to create a lanyard, or you could even simply use a length of paracord with a CordLoc on the end. 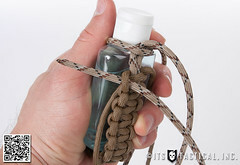 Check out all our detailed photos of the Germ Grenade Paracord Wrapping on Flickr!